Our Corby depot has a large warehouse facility and utilises a wide variety of added value services to offer comprehensive solutions. Our Corby warehousing depot is centred around large, modern warehouses with over 120,000 sq ft of space containing a mixture of racked and block stacked facilities. 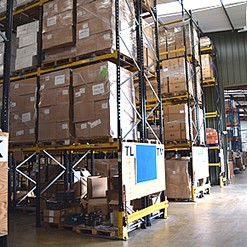 As with the majority of our depots, our warehouse benefits from services and systems which helps us to provide a warehousing service to our customers. Such services include pick and pack operations, stock management, container de-stuffing. Our web based warehouse management system allows our customers to Manage their stock, create orders for the receipt and despatch of goods. Our depot, which includes onsite security, is once again ideally located for speedy access to the motorway network. It is an ideal location for importers looking for a central hub in the East Midlands to stock, repackage and distribute goods through out the UK.